When we posted our anniversary pictures this year, it was a way of recognising the gratitude, forgiveness, effort and energy that it has taken to get to 14 years married and 26 years together (on and off). People often look puzzled and surprised when I say (on and off). It feels honest to recognise that our relationship has not been plain sailing. I work with couples and individuals in The Nurturing Journey to recover from loss or grief and improve their relationships. It would be incongruent of me to deny the challenges that a long-term relationship brings. There have been separations, mental infidelities, energetic divorces as well as commitments, joyful unions, peak orgasms, reconciliations and vow renewals in the years that we have been together. We’ve had our fair share of ups and downs and ons and offs. During these times we have been given a choice to grow together or grow apart. So far we have chosen to grow together, even when it has been tough, by looking deeply into our relationship with ourselves and each other. Sometimes we’ve done this work on our own, sometimes together with the help of counsellors or therapists. It’s always worth the investment of time, energy and money to come back to a place of consciously choosing one another. I wanted to share our experience today because I know that this is the time of year when lots of couples struggle in their relationships. You may love each other but the new year is calling to let go of the old and start afresh. You look at your life and how you want it to be in an ideal world. You start to pick at the things that aren’t 'right' in yourself and others. You feel a sense of disappointment because the promise of the perfect Christmas or holiday season hasn’t given lasting change, happiness or fulfilment. You review your life and have the realisation that you cannot ignore the chasm that has grown between you anymore. It’s time to choose. It’s time get honest with each other, review your relationship, get clear on your wants and needs and then decide how you want to move forward. Nothing can grow well unless you take time to nurture and nourish it. You need to make time to focus on you and your partner. You cannot give to others what you are unwilling to give to yourself. Simon and I are currently in retreat from our day to day work to nourish ourselves and our relationship. On the eve of a new calendar year, we are both being called to grow and expand. We face a conscious choice of whether to do this together or apart. Taking this kind of mini-retreat is an important process within The Nurturing Journey. A Nurturing Journey retreat means spending time reconnecting with who you are, carrying out a review and honest assessment of your relationship with yourself and where you want to be over the following year. It’s amazing the difference that even one hour of retreat can do never mind a day or a week. You start to feel connected, hear your true voice and see the best of yourself. It’s really powerful when you do this with your partner. I asked Simon if he would be happy for me to share a moment from this morning’s meditation practice of reconnecting with one another. He said yes, so here it is. This morning, after a particularly intense session of eye gazing and ‘soul to soul’ meditation, we were both left with an indelible experience. We had the experience of gazing at each other, seeing our reflection in each other’s eyes and connecting with deep Spirit. We’ve been saying this sentence, ‘I am in you and you are in me’, as part of our vows each week for the last 14 years. 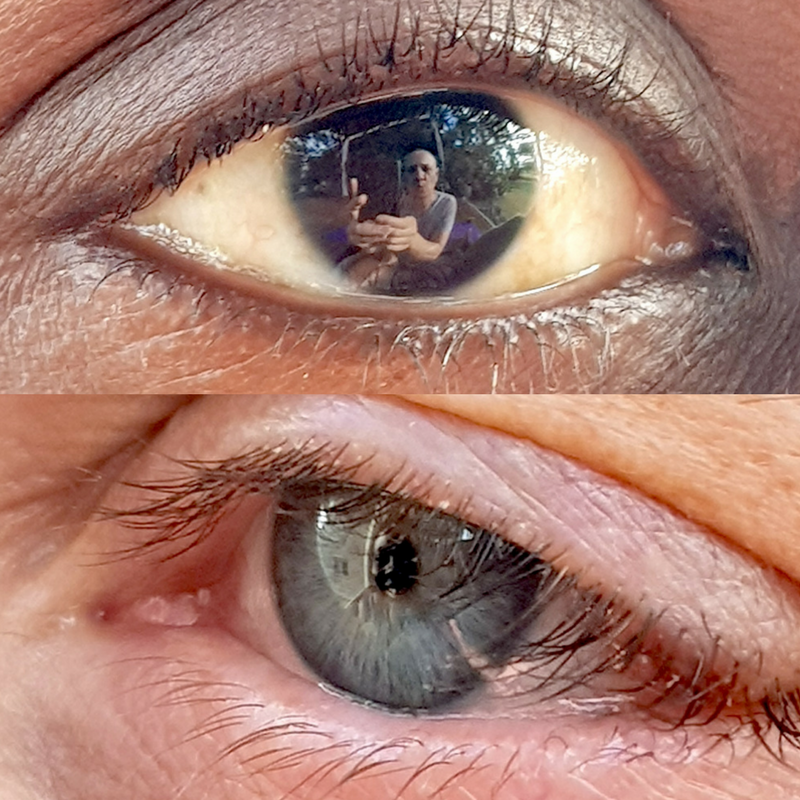 We’ve been practising eye gazing and the broader ‘soul to soul’ meditation taught by Tim Freke for a couple of years now but it’s the first time it had such a profound visual, physical, emotional and spiritual impact on both of us at the same time. So much so that we had to take a picture afterwards as a reminder. We realised, in that moment, that whatever you do to nourish and nurture the other is an opportunity to nurture and nourish yourself. We know we have actions to take together to work towards a new relationship with ourselves and each other. If your relationship is important to you, I suggest that you take some time for yourself and your significant other (if willing) to reflect, reconnect and come back to choice. You don’t have to go anywhere exotic (although this can help), you can do this from home. I want to share with you a summary of the practice we did this morning called “Gazing into the eyes of your Beloved”. Take a few moments to sit comfortably so that you can gaze into your partner's eyes. If you do not have a partner, you can do this with a mirror. It may be a little awkward at first but use your breath to relax you. Take the time to gaze softly at the eyes in front of you and truly see them. Notice the colour, texture, size of the eyes of your beloved. Then take time to see your reflection in centre of the eyes. See in your partner’s eyes that which you like, dislike, that which you desire or wish to release. Let the eyes mirror it all back to you. Then gaze beyond the physical eyes and your reflection to experience that which connects you beyond time and form. See yourself through the eyes in front of you and choose how you wish to treat yourself. Choose how you want to act towards the person whose eyes you see yourself through. This way you can have a new year and new relationship with yourself and your partner. Is it time for you to see yourself in the eyes of a loved one? Have a go at this meditation. I hope this helps you to have an incredible new year and renew your relationship with yourself and those around you. I’d love to hear your thoughts on this blog. Message me or comment below to let me know your experience. I'm happy to support you if want more specific help, just ask.